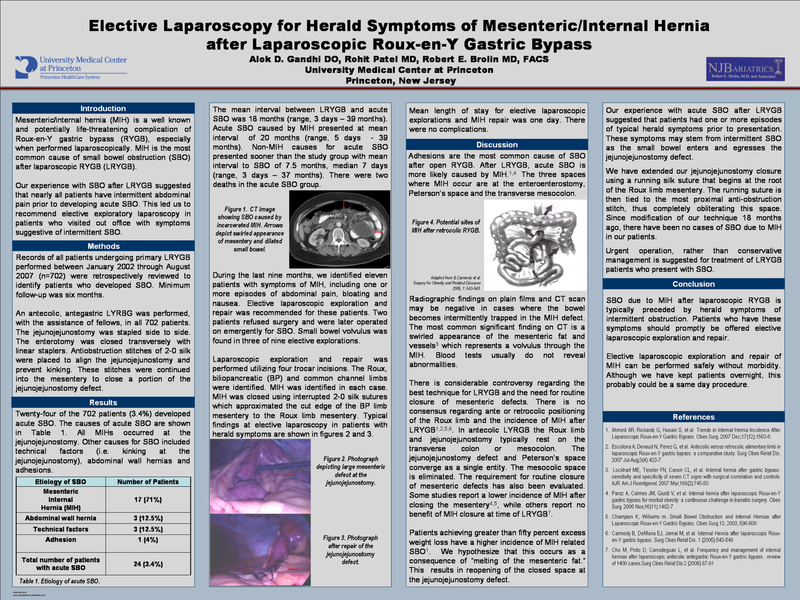 Background: Mesenteric/internal hernia (MIH) is a potentially life-threatening complication of laparoscopic Roux-En-Y gastric bypass (RYGB). Many patients with MIH have herald symptoms prior to developing acute small bowel obstruction (SBO). Methods: Records of all patients undergoing primary laparoscopic antecolic, antegastric RYGB by a single surgeon through August 2007 (n=702) were retrospectively reviewed to identify patients who developed SBO. Results: Twenty-five patients (3.5%) underwent operation for acute SBO. SBO was due to MIH in 12 patients (48%). All MIHs occurred at the jejunojejunostomy. During the past 9 months, we identified 11 patients with intermittent symptoms of SBO for which we recommended elective laparoscopy with closure of MIH. Two patients who were offered elective laparoscopic explorations refused surgery and were later operated on emergently for SBO. Mean length of stay (LOS) was one day. There were no complications. Small bowel volvulus was found in 3 of 9 elective explorations. Conclusions: SBO due to MIH after laparoscopic RYGB is typically preceded by herald symptoms of intermittent obstruction. Patients who complain of these symptoms should promptly be offered elective laparoscopic exploration and repair.